US, 1999, 114 minutes, Colour. Val Kilmer, Mira Sorvino, Kelly Mc Gillis, Steven Weber, Bruce Davison, Nathan Lane, Ken Howard. Virgil Adamson went blind when he was a child. He retains only vague memories of what it was like to see. Overworked architect, Amy Benic, takes a break at a hotel where Virgil works as a masseur. At first, she does not realise he is blind. They are attracted. Virgil's sister, Jennie, who has cared for him for many years, is apprehensive and jealous of Amy's relationship with Virgil. After resisting Amy's concern and pushiness, Virgil is persuaded by her to undergo a new treatment for restoring sight. He is afraid the procedure will be a failure. It is a success. He still has many problems such as getting used to three dimensional sight, reading, identifying objects and colours... and has to rely on his sense of touch. Moving to New York and living with Amy, he still struggles to adjust. This puts a strain on their relationship. Virgil also confronts his father who abandoned him and his sister. He breaks with Amy. Gradually his sight fades and he has to face blindness again. He begins to work with a visual therapist. Amy realises that she was too dominating and finds Virgil again. 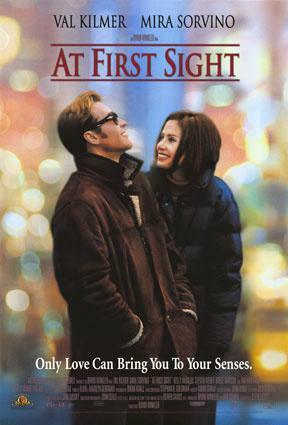 At First Sight is a very emotional movie. It is based on a story by Oliver Sacks, author of Awakenings. It can be seen as a parallel with Awakenings. Virgil Adamson regains his sight. The recovery is only temporary and he has to face going blind again, just as the patients in Awakenings went back into coma. Audiences can identify with the situation. We share the pain, the love, the struggles and, finally, the second loss of sight. The movie is filmed in the glossy studio style and relies on the attractiveness of its stars. Val Kilmer is more than usually sympathetic as Virgil Adamson. Mira Sorvino is earnest and 'do-gooding' as the architect, Amy. Kelly Mc Gillis brings a harder edge as Jennie, Virgil's older sister who has sacrificed much of her life in caring for her brother. There is another hard edge when Virgil eventually meets his father who had never accepted his blindness. He is played by Ken Howard. Bruce Davison is the doctor sponsoring the experimental treatment and Nathan Lane the Sacks-style visual therapist. Irwin Winkler is a respected producer turned director (Guilty by Suspicion, The Net). 1.The title? The irony of Virgil being blind, regaining his sight? The alternate title: Sight Unseen? 2.The New York State and New York City locations, the countryside, the contrasts of city and country? The musical score? 3.The writings of Oliver Sacks, his dealing with patients, recovery, relapsing, helping them to cope? 4.The themes of life, busyness, people helping one another, dominating, dependency? The inner peace and letting live? Letting be? 5.Amy, her work as an architect, her personality, at the office, her friends, the recommendation that she have a holiday, the skating, the massage, the encounter with Virgil, not realising he was blind? Her sleeping, crying? Her discovery about Virgil? 6.Val Kilmer as Virgil, pleasant, smile? His history, losing his sight at three, his dependence on Jenny? Not having seen her since he was a little child? His capacity for love? The dog, his work as a masseur? His walk, the phone, the meal – and his feeling detached? 7.Amy and Duncan, marriage, work, jobs? Going back, her holiday, joy, skating and trust in Virgil, relating well to him, not relating well with Jenny? 8.Her getting the information about the doctor, making the contact? Amy’s enthusiastic reading about treatment for the blind? Her acting on it without consulting Virgil? The going to New York, the risks, urging him to accept? The effect on Virgil, his unwillingness, his agreement? The experience of sight? Fear? 9.Virgil, his playing hockey on the ice, massaging his clients, not telling them that he was blind? His reaction to Amy and her suggestions? His not being asked? His having to cope with Jenny and her hostility towards Amy? 10.The meetings with Phil, Phil and his ability to help or not? A genial person? His affirming Virgil? The doctor, the introductions, the build-up to the operation? 11.The visuals of Virgil’s experience of seeing, gradual, his having to learn what he knew as a blind person, but could not recognise in reality? The mistakes? 12.Amy, her love and patience, her exasperation? The party, the clash between herself and Virgil, Atlantic City? Duncan and his influence? Her going away, her being hurt? 13.The experience of blindness, Virgil’s decisions and what courage it took, Jenny and her support or not? 14.The absence of Virgil’s father, not talking with him, his decision to make contact? The meeting between Virgil and his father, their discussions? How much dependent on Virgil’s seeing? The finale – and going away? 15.The doctor, his treatment, the warnings about the temporary nature of the sight? Virgil and his lectures, the doctors listening? The final lecture, the reality of his going blind again? 16.Virgil returning home, the blindness coming on him again? His experience with Jenny, her continued support, the joy of his having seen her in reality? 17.The final blindness, his having to cope? Amy and her return, her apology, the learning experience for each of them? The epilogue about their marriage, Virgil not regaining his sight? 18.The themes of impairment, coping, dependence, the possibilities of change, respect for the other person’s decision?